“This is an important day for Matera, for Italy for Europe, which demonstrates its ability to recognize and enhance its cultures”. With these words the President of the Italian Republic, Sergio Mattarella, inaugurated the year of Matera as the European Capital of Culture 2019. “This is a day of pride for the Materans, for Basilicata (the region) and for the many who have contributed to designing and making winning Matera the European Capital of Culture 2019. A day of pride for Italy that sees one of its excellence at the attention of the entire continent. This city is also a symbol of the Italian Mezzogiorno ( the mid-south part of Italy) that wants to innovate and grow, healing fractures and urging initiatives,” concluded Mattarella. “Everybody is worried about globalization, I would say that it would work even more if we started from the globalization of cultures, so maybe we could have a different and new Europe,” he explained before the “Hymn to Joy” anthem of Europe went on air. Matera greets Europe with a record: 2019 musicians perform together with the “Ode to Joy” sounds. The day opened when the eighteenth century Cava del Sole, redeveloped for Matera 2019, was opened to the public. There were 14 musical bands, seven Lucanians (local of the region) and seven Europeans. On the stage were the band from Matera and from Plovdiv, a Bulgarian city, the old Filippopoli, also European Capital of Culture 2019. In the Serra, the program was presented to the local, national and European institutions. Bands of musicians were positioned in the different area of old Matera, commonly called the Sassi, The true meaning of the appointment goes from the continuous participation of the citizens, who at lunchtime were hosted in homes, schools, parishes, and associations. With the support of Coldiretti, (the Consumers Association) who sponsored 5 thousand dishes of carpiata, typical dishes of Matera, for the musicians. The thermal blankets that wrap up the migrants after the sea crossings were worn by the Silent Academy guys and some models, in a parade to commemorate those who could not make it!. At sunset, 2019 candle-lights among the Sassi lit the Capital of Culture, making the atmosphere even more magical in the Sasso Barisano district, left in the dark for the project “Matera starry sky” by Francesco Foschino, with the association Scorribande Musicale. The melodies of two polyphonic choirs, the Cantori Materani, and the choir Pierluigi da Palestrina, resound in the Duomo square, accompanied by the acrobatic evolutions of the company of the Fools and the collective performance “4:33”, a totally silent song by the composer John Cage. Finally, in the Sasso Caveoso, visitors discover the Lumen project installations. A dancer in the air held up by an aerostatic balloon. In the background, the Cathedral was tinged with blue. 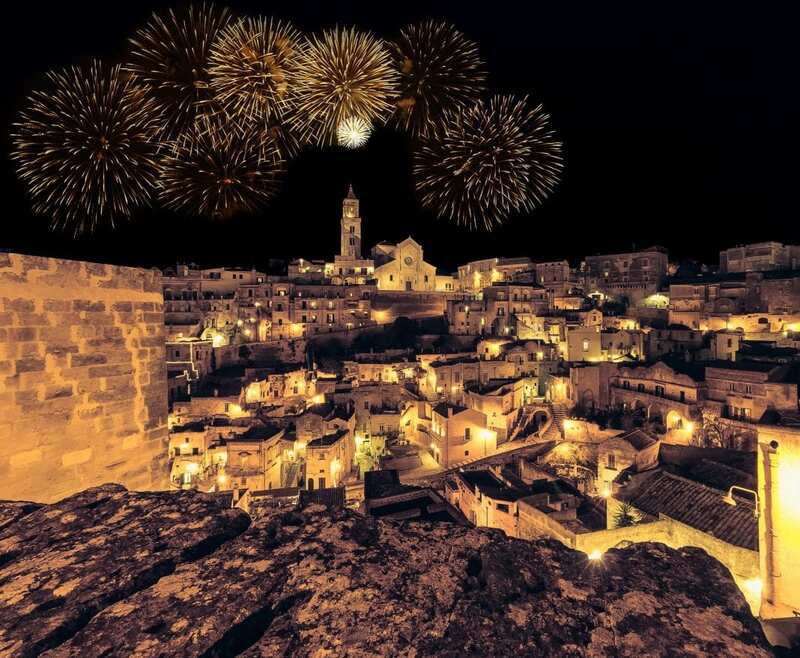 The atmosphere in Matera the European Capital of the Culture became magical. Facts: The organization of the event took seven years ( 2011 to 2019) Cost : 48 million euro, foreseen attending 700.000 visitors over 12 months. 120 artist and all Italian regions are involved.